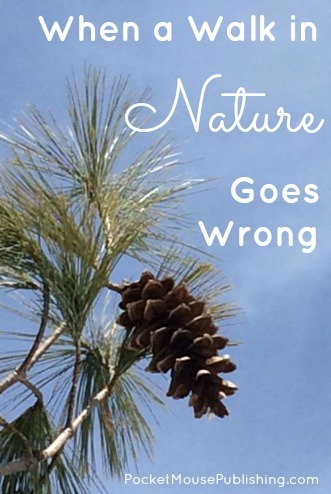 How do you handle it when a walk in nature goes wrong? I don’t mean “Drama in Real Life” wrong. Breathe easy — no cougars attacks, rock slides, or poisonous mushrooms will be featured in this account. This is about the small frustrations that occur when you’re trying to get yourself and your family away from “the electronic paradise” as the S’More Outdoor podcast so succinctly describes it. This is the red crayon in the dryer, the burned dinner, the waiting in line at the library with a whining toddler to pay the (huge) fine – so you can check out your fifty book stack. We’ve all had these types of frustrations in our daily lives. And they aren’t absent just because we want to take our children out to experience the joys of nature. Earlier this week we headed out for a walk with the dog to the woods. I was in high spirits because two of my older children were able to come along – between working and their college/highschool classes, they do not get the same quantity of outdoor time the rest of us do! Off we went, the little didn’t even where a jacket because it was such a spring-like day. First, I slipped on the wooden walkway leading across a drainage ditch. Initially my knee hurt dreadfully. But after standing up and testing it, I realized it didn’t hurt to walk (much). So on we went, with me and my oldest chatting about the importance of soil and the neat collection of monthly soil activities I found (more on this in a future post!). We finally arrived at the creek. The 9yo had gone on ahead and was out of sight, but I wasn’t worried, we had a meeting place. 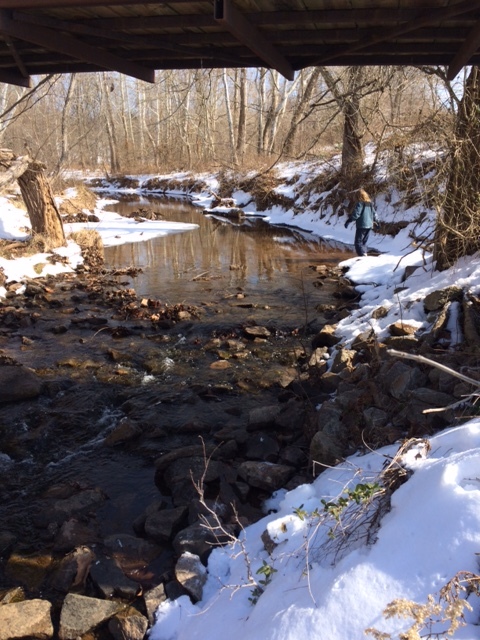 With all the melting snow our little creek was running fast and quite cold, so big brother offered to carry 5yo across. He slipped and into the icy water she went. Was she hurt? Not at all. Did she cry? Not at all. Was she cold and wet and needing to go home right then? YES! I took off my coat and wrapped her in it, picked her up, instructed the other three to locate 9yo and come home. So much for family time out in glories of nature. Then I headed home with a bum knee, a shivering 5yo in my arms, and a very unhappy dog who didn’t like her family heading in different directions. Halfway home, coming down a rather steep hill, the dog stopped and looked back. She wouldn’t budge. Then over the hill came the dejected 9yo. My initial (horrified) thought was he had discovered no one was following him and came back to look for us, somehow missing his siblings…who were now wandering the woods looking for him! But no, they had found him and were not far behind. He was unhappy because he hadn’t gotten his nature walk. We all finally arrive home. And swore off walking in the woods forever. No, actually, we didn’t. Think about those small frustrations. After the crayon in the dryer incident, did you take ALL your family’s dirty clothes to the dry cleaners henceforward? After the burned dinner, did you only eat in restaurants? And have you never returned to the library simply because you were embarrassed by a fine? Of course not! We move on, we overcome, and maybe we can even laugh about such incidents in the years to come. When the immense bruise on my knee fades, I may laugh. In the meantime, we’re still walking in the woods and on the paths and to the park…anything to get our daily dose of nature, no matter the weather. It has been 33 days since we started. I think we’re on the way to a habit! Don’t give up on getting out into nature just because it isn’t idyllic every time you venture out! Check out this encouraging National Wildlife Federations Health Benefits page and get back out there with your kids! Do you find getting out into nature with your kids frustrating? Have you ever had a nature walk go wrong? Next > Do You Have a Nature Habit?